Here come the next ones: What differentiates Generations Y and Z when it comes to the use of communication channels? Which are popular and which are out? It turns out that Facebook has lost popularity. In addition, it seems that the gap in information among young people continues to grow. This year's Youth Barometer provides the information necessary to make initial comparisons between Generation Y (born between 1980 and 2000) and Generation Z (born after 2000). All of those surveyed can be considered "digital natives" who spend a great deal of time online – and so, accordingly, these differences are evident first and foremost in digital usage patterns. The preferred platforms for Generation Y include Twitter, Facebook and the internet in general, and they even watch television sometimes. The younger Generation Z, in contrast, enjoys spending time on Instagram, Snapchat, WhatsApp and YouTube. A polarization in how both of these generations gather information is evident in Switzerland. The good news: Young people accessing information about what is happening in the world multiple times every day grew from 29 to 38 percent since 2010. 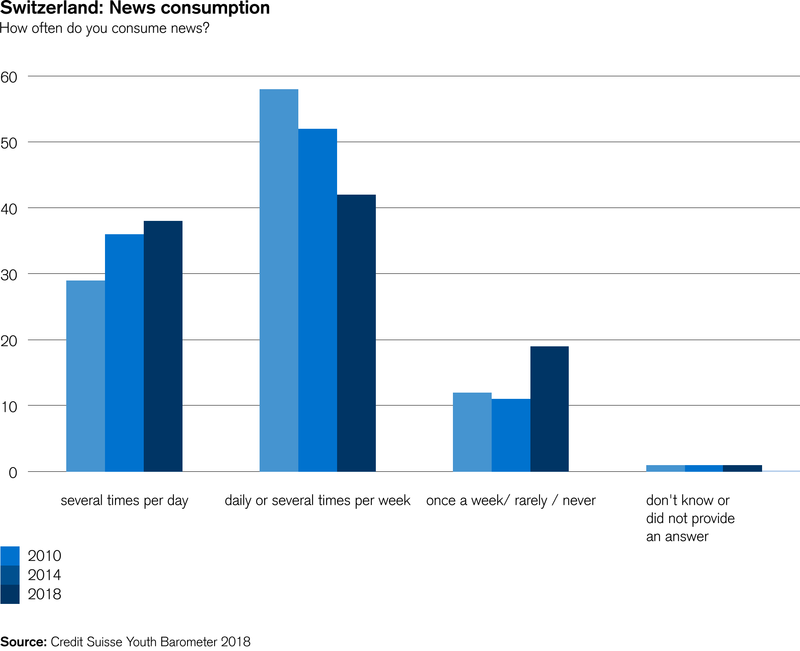 When seen together with the next two groups ("access information once a day," "access information several times per week"), then four out of five young people are relatively well-informed about current events. The not-so-good news: The group of young people who access that information only once weekly, even less frequently or never at all also grew since 2010 – from 12 to 19 percent. In other words, one out of every five young people lacks any substantial information about what is going on in the world. 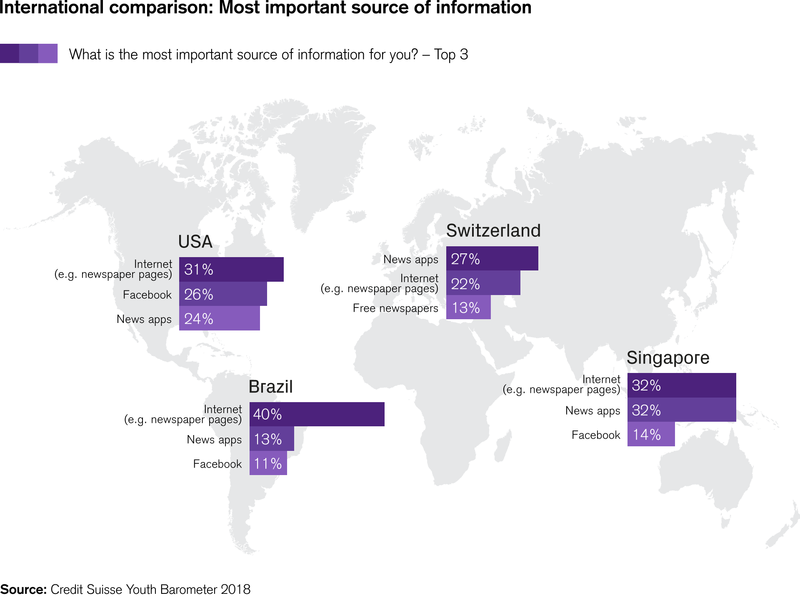 The study also examined where the 16- to 25-year-old Swiss people collect information about world events. Practically all media saw a decline in popularity in recent years, but none more than the free print newspapers such as "20 Minuten" and "Blick am Abend" – up until 2016, these had been something like guideposts for this generation. This does not mean that the affected newspapers lost readership, as it appears that printed newspapers are often replaced by digital publications. News sites and digital newspapers are now most favored by young people, followed by news apps for smartphones and tablets. Television and paid newspapers lost half of their audience since 2010. Radio managed to hold steady until 2015 and has lost popularity rapidly since then. But the loss affected not more than just the traditional media. The use of Facebook as a source of information grew from 2010 to 2015, and its significance has dwindled ever since. A major study conducted by the Reuters Institute (Digital News Report 2018) recently came to the same conclusion. On the one hand, Facebook has fallen out of favor among young people, yet on the other hand, the platform itself prioritizes user-generated content more highly than professional content. In any case, the Youth Barometer clearly shows how fast this new world is turning and how deep brand loyalty runs. The next platform is always just a click away. What is currently hot, what is not? The internet is a must for everything that is considered to be "in," since 80 percent of young people in all countries spend two hours or longer online every day. 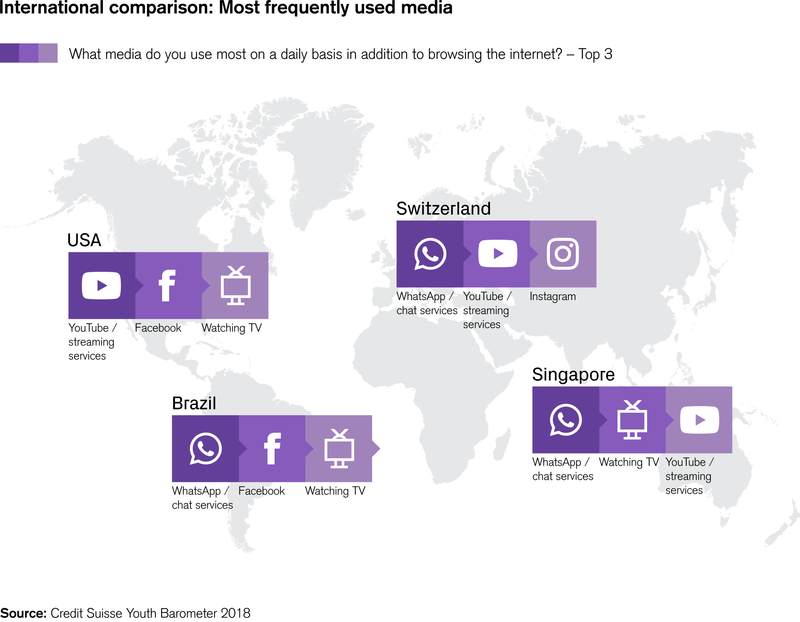 In young people’s hit lists, the smartphone ranks at the top (Switzerland) or second place (US, Singapore) WhatsApp, YouTube, Netflix and email are also "in." Facebook is popular, too, although it has fallen somewhat out of favor among young people. In Switzerland, it has even disappeared from the top ten list. 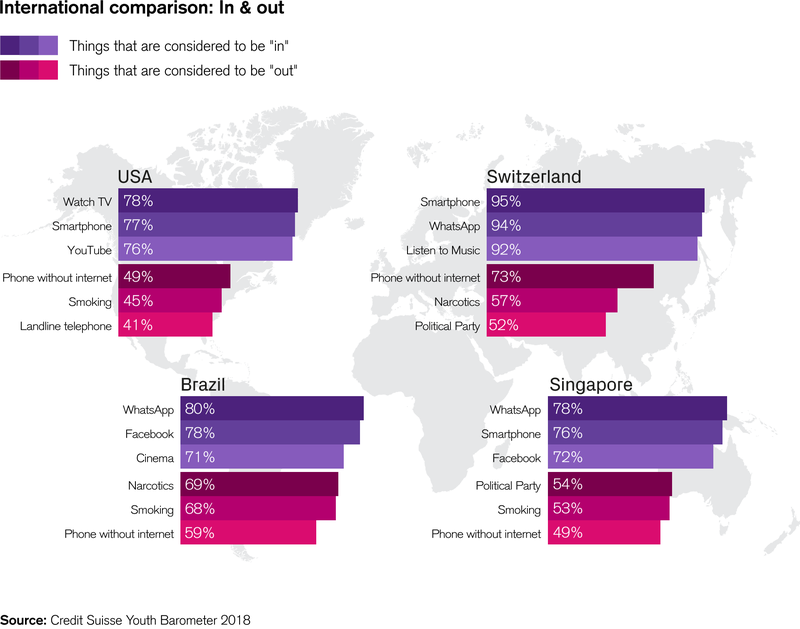 For the things young people consider to be "out," there is strong parallel across countries. Mobile phones without internet ("dumbphones"), smoking and drugs are unpopular, as are political parties. Just one distinctive local feature for each country: Practicing one’s religion is considered uncool in Switzerland. E-bikes are out, or at least not yet "in" in the US. In Brazil, you don’t follow celebrities on social media, and engaging in many sexual encounters is frowned upon in Singapore. In the Download Center you will find all the final reports, analyses and information graphics for the Youth Barometer. Get a valuable overview of the results of recent years to help form your own opinion.